Ive been using eQSL for about three years and i am currently a Silver Member.During this time i have had the pleasure of receiving many eQSLs and also sent them off to DXCC all over the Globe. I recently received an eQSL eDX Award for confirming 33 DXCC,and i am well on my way to obtaining the eDX100 Award,there are other eQSL Awards available to Hams and SWLs. To find out more visit the eQSL site via the link at the right column. You can become a member of eQSL for free and for a small donation you can be a Bronze,Silver or a bit more cash gets you Gold status.Membership allows you to upload your own designs and other privileges. Its still nice to receive paper QSL Cards and Ive had quite few of them lately via the Burro and a few direct.Many Thanks to all Stations exchanging both QSLs and eQSLS all are returned. The service so far has been excellent the Cards are on the print list and hopefully will be here in the next several days. I have a small pile gathering of cards which i have to return so i guess i will be busy with the pen and my log for a while.That's another part of the hobbie which makes it fun,its surprising how many QSL Cards you end up with. Just wanted to say hi from the other side of the pond. Name here is Ken N2OBY, QTH is Fishkill, NY. I've been following your blog for a few months now and look forward to working you on the air. 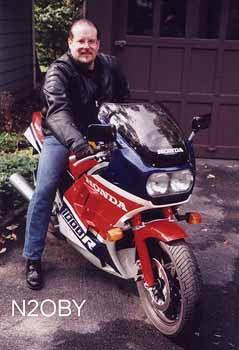 I ride also - 1986 Honda VF1000R & '84 VF1100S (V65 Sabre). 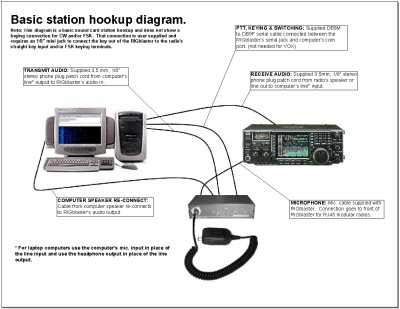 In the process of re-working my web site, but you can see the 1000R at www.qsl.net/n2oby. My XYL Lisa and especially loved seeing the video where you and Louise took Dudley to the beach! Cats & dogs rock - along with radio and motorbikes! Again, I look forward to meeting you on the bands. Hi Ken Sorry it has taken so long to read your comment on my post "The Things We Hams Talk About"
I was Pleased to Hear You are a regular reader of this blog and i hope you continue to enjoy it.Many Thanks for visiting. I remember the VFs they are nice bikes,as you have been over hear you will remember our country roads good biking roads.I am Glad you like it up here in the North and i hope you get to visit again soon. 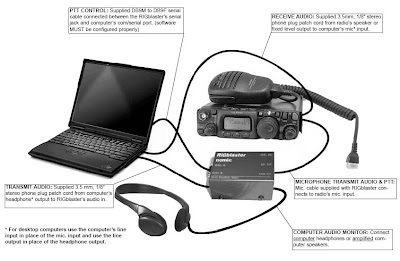 It is very interesting about yourself been in the Air Force i used to be in The Air Training Corps when i was younger where i first met Ham Radio.I still get to work with the Air cadets from time to time. Ken say Hello to your XYL Lisa from Louise and myself and a Ruff from Dudley, Ill be listening for you on 20M and at the moment its wide open hear stations from all over. The program that i am using here is WINPSKse. Download it here. Once installed you will have to connect your Radio to your Computer.You need a double ended 3.5mm mono jack plug cable which connects to the ext speaker socket in the back of your Radio,which then feeds the audio/received data out into the Line in or Mic in, on your Computer.You can adjust the level using the P.C sound control there is usually a setting on most programs which allows audio in adjustment. You are now ready to receive PSK,select the waterfall window and click on the signal. The next stage there is a bit more expense you will need to acquire more kit,a radio computer interface better known as a Rigblaster.There are various models on the market as you can see in the picture the one i use is the cheapest, its the Nomic and its been working well.The Rigblaster connects to the computers serial port or if you don't have a serial port there is a usb to serial patch lead that's available in most P.C Stores.The Line out from your P.C provides output during transmission so this is connected to the line in on the Rigblaster. The picture shows my Rigblaster in line with cables. 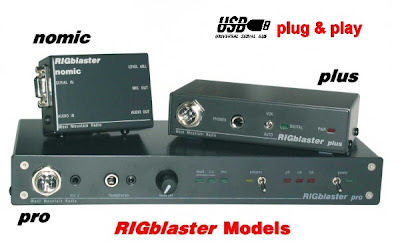 The last cable to connect is the Rigblaster mic lead which simply replaces your mic,the Rigblaster has a jumper lead system which allows quick and easy mic wiring for all manufacturers of radio.On the software settings you will find the option to configure the port that controls the Rigblaster this is usually comport 1.There are other settings to play around with once your up and running you can set up templates and other features which are fairly easy to do.Good Luck! Last Night was quite busy for me on 20M with lots of Stations to work.Thanks to all Hams that gave me a call! 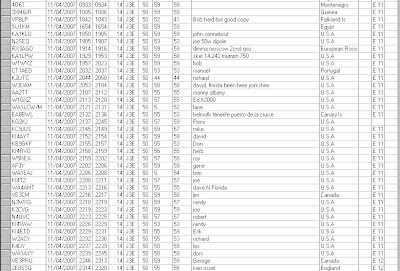 Here's my log containing the callsigns of the stations I worked. Here is a video with a few of the Stations that i worked.73 I hope you like it!